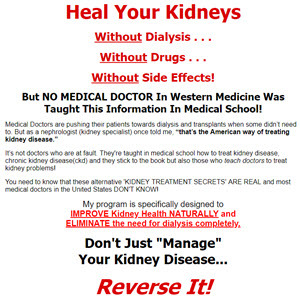 Historically the production of dialysis fluid was by the manual mixing of concentrated electrolyte solution with water in a large tank, which was then heated and pumped to the dialyser . With the advent of single-patient proportioning systems in the late 1960s, the production of the dialysis fluid moved to the patients bedside and whilst this approach remains the most widely used, alternatives such as a central delivery system or systems that incorporate pre-mixed dialysis fluid continue to be used . Fig. 1. Two different approaches to bicarbonate concentrate used in haemodialysis. a The Bi Bag (Fresenius Medical Care). b BiCart cartridge (Gambro Renal Products). 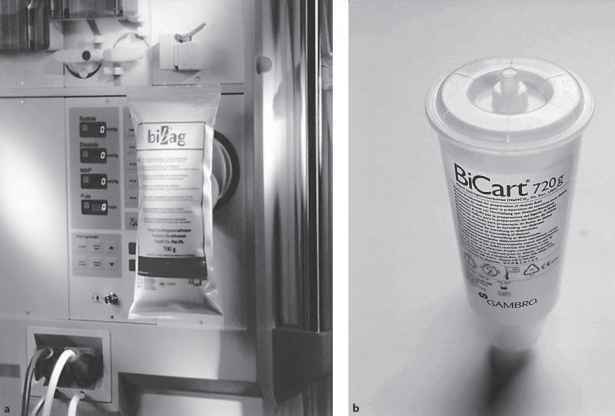 Early single-patient proportioning systems used sodium bicarbonate for buffering, but problems arising from the formation of calcium carbonate meant that this approach was abandoned in favour of acetate . Acetate remained the buffer of choice until the early 1980s when, with the increased use of high-efficiency dialysis treatments and the availability of new technology to minimise calcium carbonate formation, bicarbonate re-emerged as the preferred buffer. 1:1.83:34, and 1:1.72:42.28 (acid concentrate:base con-centrate:water). The different proportioning ratios are a consequence of the presence of varying amounts of sodium chloride in the bicarbonate solution, necessitating a corresponding adjustment in the acid concentrate to achieve the final electrolyte concentration. The dialysis fluid thus produced is heated and degassed before passing to the dialyser. Safety circuits monitor the ionic composition to ensure patient safety and comfort. At the normally used temperatures (36.5-38°C) dialysis produces a marked increase in body temperature and considerable heat accumulation arising from peripheral, and cutaneous vasoconstriction arising from the body's compensation for the ultrafiltration induced decrease in blood volume. This thermal accumulation contributes to treatment-related vascular instability and has led to the development of temperature or thermal balance monitoring and control systems to minimise hypotension [4, 5]. FDA 89-4234 manual on water treatment for hemodialysis. NS = Not specified. EBPG = ERA-EDTA best practice guidelines. a Action level 50 CFU/ml. b Action level 1 EU/ml.